The 65 Pilgrims pose in St. Stefan's Church, Stockholm, 19 April 1998 following the 11 A.M. Church of Sweden Family Service. Posing after the 11 A.M. service at St. Stefan Church are (from left to right): Father George Majoros of St. Charles Borromeo, Philadelphia; the newly-ordained Father Stefan Gaspar of St. Johannes (Church of Sweden), Stockholm; Father Joseph McLaughlin of St. Vincent de Paul Church, Richboro; Pastor Erland Ros of St. Johannes (Church of Sweden), Stockholm; Pastor Paul Sorcek of Advent Lutheran, Richboro; and Father Rune Thuringer, SJ of St. Eugenia Church, Stockholm. The banner from St. Vincent's Early Childhood Learning Program, held by students and the director of St. Johannes Pre-School Program after the service at St. Stefan's Church. 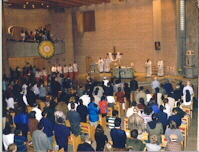 Pilgrims participate in the 6 P.M. Mass at St. Eugenia Catholic Church, 19 April 1998. 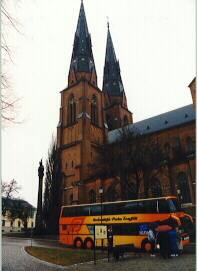 Pilgrims visited Uppsala Cathedral on Monday, 20 April 1998. Rev. Klaus Dietz, S.J., Pastor of St. Lars Church, Uppsala, gave a tour. Lunch at Gripsholms Värdshus, Mariefred, 21 April 1998. From left to right: Mike Cannon, Father George Majoros, Jack and Rose Marie Mitala, Father Joseph McLaughlin, two Loretta McLaughlins (Father's sister and mother) and Jeanne Flowers. All photographs by Bob Rauchut. Pilgrims who made the first St. Vincent de Paul Parish pilgrimage to Paris, France, in February, 1997, almost immediately recommended continued pilgrimages with the "living stones" theme: with Jesus Christ as the cornerstone, we in our parish are joined as "living stones" (1 Peter 2:5) into a holy temple, the Church; our parish is but a stone in the mosaic which is the Universal Church. Our Pastor, Father McLaughlin, developed this theme after seeing the "Consecration Stones" of St. Eugenia Church in Stockholm, Sweden. So he suggested Stockholm as the second pilgrimage destination, and since Sweden is a Lutheran country, he proposed that we invite our neighboring Lutheran Church to accompany us for an ecumenical pilgrimage. After our Parish Pastoral Council met, and Pastor Paul Sorcek met with the Council of Advent Lutheran Church, both parishes endorsed this pilgrimage. Father McLaughlin had begun corresponding with Rene P. Thuringer, SJ, of St. Eugenia Church, in April, 1997. 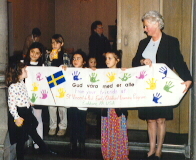 By June a Steering Committee had been formed to plan the Stockholm pilgrimage for April, 1998. Membership from St. Vincent's Parish included: Father McLaughlin, Barbara McKeaney and Dulce Mooney; and from Advent Lutheran Church: Pastor Sorcek and Paul and Julie Anderson. The Andersons had traveled in Sweden and Paul speaks Swedish. The cost of the pilgrimage was collected in installments, beginning in July. Several meetings of the pilgrims were planned, both to report on travel arrangements and to provide opportunities for pilgrims' suggestions. Pilgrims from St. Vincent's Parish participated in a December Lucia Fest at Advent Lutheran. During March Paul Anderson offered introductory Swedish lessons to all the pilgrims. Both Pastor Sorcek and Father McLaughlin believe that the planning process brought their congregations closer together. On Thursday, April 16, 65 pilgrims left Richboro for Newark International Airport by bus, and for Stockholm via SAS. Arriving at Arlanda airport Friday morning, April 17, their bus ride to the Birger Jarl Hotel included an orientation tour of the city including visits to the City Hall, where the Nobel Prize Awards Banquet is held, and the Storkyrkan, Church of Sweden Cathedral. Welcoming them at the hotel were Father Rune Thuringer, SJ, Pastor Erland Ros, Mrs. Josephine Larsson and Mrs. Lois Linstrom, all of whom offered assistance. Friday at 4 P.M. Father Thuringer gave the pilgrims a tour of St. Eugenia Church, explaining the history of the consecration stones, and on Saturday morning he gave the group a walking tour of Gamla Stan (the old city). Sunday at 11 A.M. they participated in a family service led by Pastor Ros and the newly-ordained Pastor Gaspar at St. Stefan's Church, a Church of St. Johannes Parish. At the end of the service Pastor Sorcek and Father McLaughlin brought greetings from our respective congregations. The service included a Resurrection pageant by their pre-school children, and afterward, at the fellowship gathering, St. Vincent's parishioners presented them with a banner sent by our Early Childhood Learning Program. At 6 P.M. the pilgrims participated in the weekly Sunday Mass in English at St. Eugenia Church. Father Majoros and Father McLaughlin concelebrated with Father Francisco Herrera, SJ; Pastor Sorcek and Pastor Ros were seated in the sanctuary; a number of the jointed the choir for the Mass. Father Herrera welcomed the pilgrims, and also welcomed a family life team from the Philippines who were presenting a program in the parish. At a coffee and cake social afterwards the pilgrims met some of St. Eugenia's parishioners, who come from 85 nations, and they gave Father Thuringer the stone sent by our Early Childhood Learning Program as a memorial of our pilgrimage. Monday morning took the group 42 miles northwest of Stockholm to Uppsala, an ancient religious center and a university town. At 11 A.M. in St. Lars Catholic Church they participated in an ecumenical service led by Father Klaus Dietz, SJ, Pastor Stanley Rydell, Church of Sweden, and Rev. Michael Nausner, Methodist. Following the service they spoke informally of the ecumenical climate in Sweden. Before leaving the Uppsala area, a visit was made to the 13th century Cathedral and Gamla Uppsala with its 12th century parish church and Viking burial mounds dating from the 6th century. It was there, where the first Catholic Cathedral was founded and where Pope John Paul II celebrated Mass during his visit to Sweden, that Rose Marie Mitala found the stone which was brought back as a reminder of our union with the Church in Sweden. Tuesday took the pilgrims 42 miles southwest of Stockholm to the village of Mariefred for a guided tour of the Gripsholm Castle and an excellent lunch at the Gripsholms Värdshus. The Lord blessed us with a sunny day, and all were grateful to Julie Anderson who recommended and planned that excursion. No group activities were planned during the day Wednesday. That evening the entire group enjoyed a farewell dinner planned by Dulce Mooney; Father Thuringer joined them. They returned home Thursday. I felt the Lutheran Service at St. Stefan's was the highlight of my trip. It was truly beautiful and the hospitality afforded me was wonderful. The Lutheran service was a special treat. But I also enjoyed being part of the choir at St. Eugenia. Father Thuringer was a delight. I have just passed through a memorable experience. The many days spent with this group will last for some time in the garden of my memories. The ecumenical experience with the various members of the churches involved and the response of this group was outstanding. The experience in Sweden with the inhabitants, the restaurant clientele and hotel personnel made our stay very pleasant. Our Pilgrimage to Sweden was a very rewarding and pleasurable experience. The warmness of the Swedish clergy and people plus the cameraderie of our fellow travelers made this a trip we shall always remember. We really enjoyed the trip to Stockholm, Uppsalla and Marifred. As the odd protestant newly-weds from Addisville Reformed, we enjoyed the friendship and comeraderie of several St. Vincent couples. Wednesday nite dinner was great, thanks to Dulce. We would like to be invited on future pilgrimages. We enjoy visiting cathedrals and castles as well as quaint towns. Our pilgrimage to Sweden was inspiring and informative. It was a great way to get to know our fellow Christians, and be united with them as we are called to do. My thanks to Father, Jeanne and Dulce for all their hard work putting this trip together, and for letting me join in being a part of it. Excellent trip! Good percentage of time for planned activities and free time. Stockholm was a good destination. Personalities of the group seem to fit very well. My suggestion for next year would be Ireland. A natural for a large percentage of the group. Spirituality, structural sights and symbolic sounds surrounded our Stockholm trip. Sharing services provided a communion with all our Congregations; certain to be one of longevity. Shapely stones that will be viewed by all: more significantly our spirited loving stones to shape our world. Our first trip to Europe! Found companionship and the tour very enjoyable. The best part of this pilgrimage was the people. The people from both Advent Lutheran and St. Vincent de Paul Communities shared a common purpose as living stones at the place where the idea was learned. I obviously know a few more people from my parish and community as a result of this experience. The trip was great! Very enlightening. It also brought out names to faces of fellow parishioners. It was a fabulous trip and the people were very helpful and wonderful in all ways. For us, the genuine appreciation and hospitality of the Lutheran and Catholic congregations was a moving and humbling experience. My first pilgrimage, it was wonderful. I will always have fond memories and new friends because of this trip. P.S. I A.M. going to join the Choir! I enjoyed the Pilgrimage immensely. Everything was done well. I have no criticism. I enjoyed the company on the trip to Sweden and the opportunity to spend time with my mom and sisters. I will always treasure the memories of my very first trip to Europe: the Pilgrimage to Sweden. The people we met, the Liturgies that were celebrated and the time we shared helped us to discover God among us. When you're daydreaming of Sweden  always remember "open up your heart and let it go"! You have a wonderful group of parishioners who pray as well as they play. God blessed you when He sent you to Richboro. "Mother" offered many "thank you's" as I trudged up steps to visit the Churches on our pilgrimage. Spring in Stockholm means gray skies brightened by the sunny smiling faces of the Richboro pilgrims. The Easter play by the children of St. Stefan's was a joyous beginning to a Sunday of prayer together. As we visited churches ancient, modern, small and large, the bonds of friendship and community were strengthened. The pilgrimage experience is uplifting. A trip with 1001 lifetime memories! Broke bread with the Swedes, kibitzed with "kababayans" from the Philippines, shared nursing techniques at the Karolinska Institute, danced at the Hard Rock Cafe, relived history at the Vasa and Gripsholm Castle, scraped my hands and knees at the Royal Palace, dined and supped, and most of all, enjoyed everybody's company!! Million TACK!!!! We touched each other with friendship and love but left Sweden a richer country by the enthusiasm that was aroused between Father Thuringer of St. Eugenia Catholic Church and Father Ros of St. Stefan's Lutheran Church. Thoughts while flying home from Stockholm: Ecumenism is alive and well. One can imagine more easily how things might be in future generations for all Christians. Ecumenism is a link both spiritually and physically for people who would not otherwise be together. The more things are different, the more they are alike. People from two different beliefs when they come together in friendship and faith, soon learn now much they are alike. People visit others in a "foreign" country, and very quickly learn that it is less "foreign-ness" and more familiarity. The more we come to know how vast is the world we live in and the people so different, the more the world shrinks and the people become as one. Praise God for the gorgeous scenery! Amen. This description of the significance of "Consecration Stones" in St. Eugenia Catholic Church in Stockholm, inspired Father McLaughlin to seek "stones" for St. Vincent de Paul Church: visible reminders of our union with other Christian communities throughout the world. Pilgrimages have enabled personal contact with these Churches; and this ecumenical pilgrimage brought the Advent Lutheran and St. Vincent de Paul communities closer together. When a Catholic church is consecrated by a bishop, the building is anointed with oil in 12 places. The church stands on the foundation of the 12 apostles; in the church as God's people on earth, the 12 ancestral tribes of the Bible live on; the church building is a symbol of the heavenly Jerusalem. These 12 places on the church's walls are normally marked with a Cross and on special feasts with lighted candles. In most of our medieval churches these consecration crosses are still visible. In our church these places are further marked: with 12 stones collected from 12 different countries. They come from the countries from which the church in Sweden derives its origin or from which it has received strong impulses and also from which many parish members come. The stones come from Peru, Spain, Hungary, Poland, Zimbabwe, the Philippines, France, England, Italy, Czechoslovakia, Israel and Germany (listed in the order in which they are placed in the church beginning in the baptismal chapel). make us humble before our responsibility, to become "living stones built as a edifice of spirit" (1 Peter 2:5). Latin America is characterized by social injustice and political oppression, but also by a church that makes stirring and real contributions to those without consolation. Latin America bears crucial impulses for the church of tomorrow within itself. During the 1970's the parish of Saint Eugenia received many fellow-believers from this continent. The stone from Lima in Peru represents all of them. It comes from the shrine Sanctuario del Señor de las Milagras (The Sanctuary of the Lord of Wonders) which is under the care of the Carmelite Nuns. May the Lord complete the wonders of His grace in our hearts and in our world. The stone will not only remind us of the many Catholics from the Iberian Peninsula but even bring to mind another part of our background. The stone comes from the castle Loyola in Northern Spain, where Ignatius, the founder of the Jesuit Order, was born. After the Reformation many Jesuit fathers, in spite of an official ban, practised pastoral work in Sweden. Priests and brothers of the Jesuit Order have been active in Saint Eugenia's Church since 1879. Maria Remete  Our Lady of the Refuge  is one of the Hungarian Catholics' favourite shrines. It lies outside Budapest and reminds us of the large stream of refugees that the year 1956 brought from Hungary to Sweden. The stone represents even the many groups and individuals from other parts of the world who were forced to leave their homeland, received refuge in our land and found a home base in our church. In this way the church community grows and experiences its universality. From Czestochowa, Poland's national shrine, comes this stone. The cloister with its madonna picture once checked the Swedish conquest. Relations between Poland and Sweden have varied over the centuries. In our day we are experiencing the power of faith in the lives of the Poles, above all since Pope John Paul II, a Pole, heads the entire Church. Many Poles have come to Sweden as refugees. They are helping to build up the Catholic Church in our country, especially through the work of the numerous priests and sisters. The Church wants to serve as an intermediary between the message of Christ and different cultures. In Africa it also wants to help integrate the black and white people in the unity of Christ's Church. Before reaching that goal, however, the Church of today has been the scene of bloodshed and persecution. This stone comes from Saint Paul's Mission, Muscami in Zimbabwe. Three Jesuits and four Dominican sisters sacrificed their lives there on 6 February 1977. Christ's sacrificial death continues through the ages. But, so does His resurrection. In our days the whole world is shrinking, people of different races and nations have come nearer to each other. Even the parish of Saint Eugenia has received part of this development. From the Lawigan River bed at Barrio Timganga Bacong, located on the east side of the island of Negros inside the group of Philippine Islands, comes this stone. It reminds us that even in some places in the Far East, Catholic life is strong, traditionally rich, and even stimulating for us. Pilgrims from our parish were able to take back with them a stone from the revelation grotto in Lourdes. It brings to life the faith of Lourdes for us but even represents the rich tradition of French Catholicism that has inspired Catholic life in Sweden from the Cistercians in the 12th century to the Dominicans in the 20th century. "May this stone be a bond between our churches that are founded on the one rock that is Christ", writes the rector of the Shrine of Our Lady of Lourdes upon the document that verifies the stone's authenticity. The stone from Bolton Priory in Yorkshire reminds us about the many Christian missionaries that in the 11th century came from England to Sweden. They laid the ground of Christianity in our country through, among others, Saints Sigfrid, Eskil and David. The stone comes from the ruins of an Augustine cloister from the 12th century. In the 1950's brothers and sisters from the English Province of the Passionists resumed the tradition of enriching the life of the Church in Sweden with an inheritance from the British Isles. From Saint Francis's own century comes the brick stone that through the Society of Saint Francis has been transported from Assisi to our church. With it stands Saint Francis and his spiritual inheritance before our eyes: love to God and to all of His creation, simple, joyful closeness to the crucified Christ. The Italians have for generations built the framework of Stockholm's Catholic life. The stone comes from Sady Velehrad in Moravia. There the remains of a cloister and mission centre from the ninth century stand, the time around Saints Cyril and Methodius, the great apostles of the slaves. Their missionary works extended over many lands and peoples and their way of working was open. The stone calls upon us also to pray for our fellow-believers who are currently being subjected to persecution because of their faith. This stone is from the temple area in Caesarea Maritima, "Cesarea on the Sea". There Philip, the deacon, was active; Peter baptized the heathen officer Cornelius, and Paul preached the word of Christ before King Agrippa. In Cesarea the universal perspective of the Church opened up for Christ's apostles as the Church grew out of Judaism and became all-encompassing. With this stone from the Holy Land, the New Testament and all of the first generations of Christians come to life. This stone from the cathedral in Cologne reminds us of the co-operation among the different members of the same Body of Christ. For over a thousand years the Church's development in Sweden has been connected with the Catholic life of Germany: from Saint Ansgar's first missionary works at Birka, through the time of the Reformation to the works of our present day's priests and sisters. Without the extraordinary financial support from Catholics in Germany, this church could not have been raised. The pilgrims participated in the 6 P.M. English Mass there 19 April 1998.